The adage that you can’t tell a book by its cover also applies to cars. 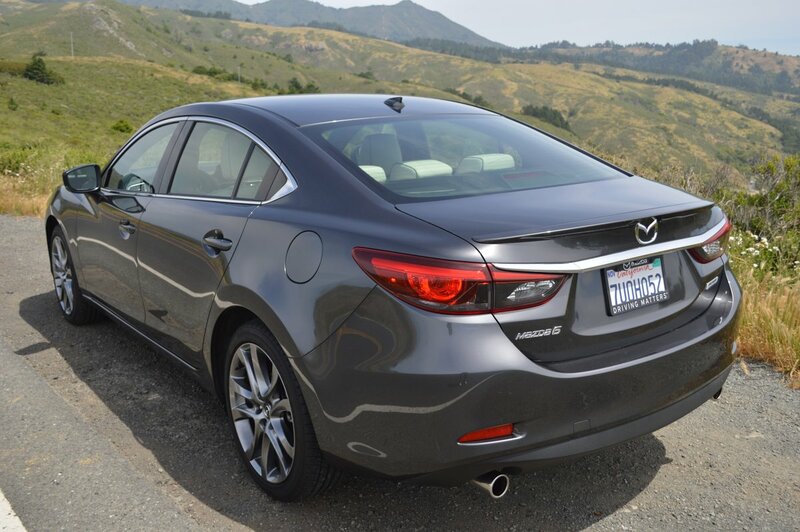 One glance at the Mazda6 will not leave you breathless in anticipation of driving it. The 6 is neither beguiling particularly looking nor palpitation inducing. 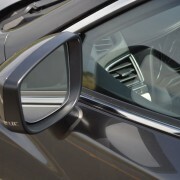 Rather, it is handsome in a refined way, with pleasing proportions, sleek aero refinements, and a noble stance enhanced by 19 inch alloy rims. 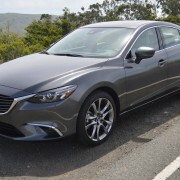 But this Mazda, which remains unchanged this year (after an interior facelift in 2016) is a top candidate for best midsize sedan honors. Everything about the 6, from value, to build quality to performance is top notch. If you can live without the adrenalin spike of a heart throb exterior, than the 6 will fill the bill in every other way. On the value front, the base price here is just $30,695. That buy-in gets you all the basics, including a big displacement 4 cylinder engine producing 184hp and 185 lb.-ft. of torque administered through either a 6 speed manual or 6-speed automatic gearbox. 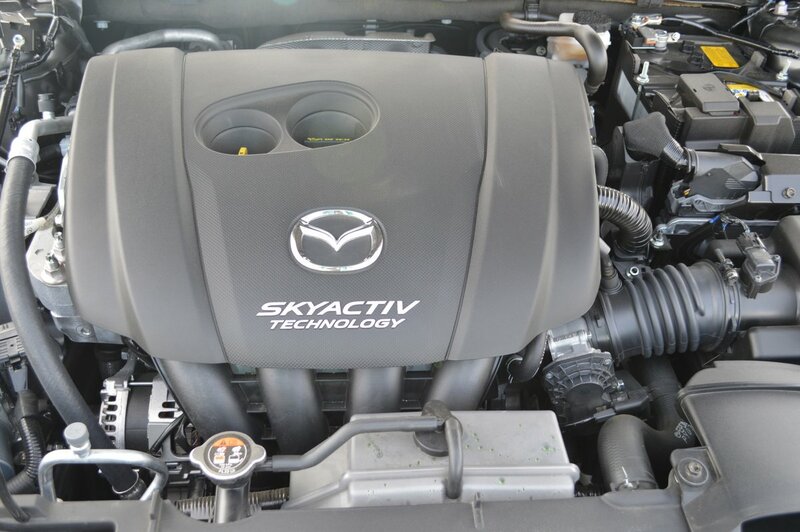 While the Skyactive four banger’s output is not exactly earth shattering, you must factor in the 6′s comparatively light curb weight of 3,185 lbs to evaluate the car properly. 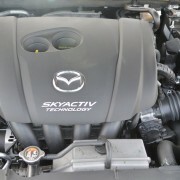 Doing so reveals a lively power-to-weight ratio of 17.3 pounds/hp. 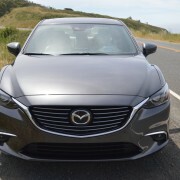 When you flatten the go pedal here, the Mazda6 gathers speed with satisfying alacrity. 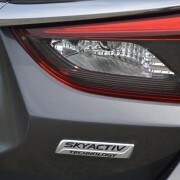 Our test car was equipped with the “Skyactive Drive 6-Speed Sport Mode” automatic, which utilizes a fat knobbed, floor mounted stick for control, plus a pair of paddles attached behind the rim of the steering wheel. You can manually control this transmission with either the floor stick positioned in the manual (left side) gate or simply bang your shifts via the twin paddles. 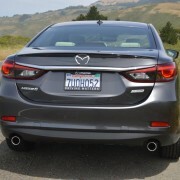 In either case, the Mazda responds instantly to command inputs, making this sedan fun to operate with close supervision. The Sport Mode switch is found on the center console and when activated, transforms throttle response from average to instantaneous. 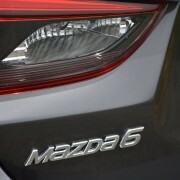 It should come as no surprise that Mazda has honed the responsive suspension of the 6 to a sharp edge. 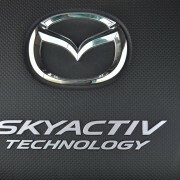 The beauty of Mazda engineering’s “Driving Matters” motto is that this company favors handling over any other automotive attribute. 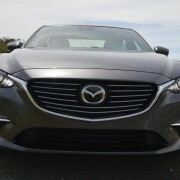 This dictum is as evident in the Mazda6 as it is in the company’s iconic sports car, the MX-5 Miata. The underpinning goodies start with standard front and rear stabilizer bars for a flat platform in the turns. Suspension geometry is close to ideal thanks to independent design architecture front and rear. 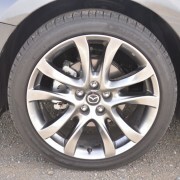 Mazda finishes off the package with standard 19 inch alloy rims, unexpected on a sedan in this price range. Those rims carry Dunlop SP Sport 5000 radials (225/45R19) well suited to carrying speed through apexes on twisty back roads. 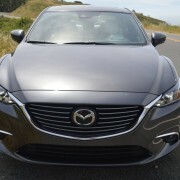 As a sports sedan, the unheralded Mazda6 is the real deal. 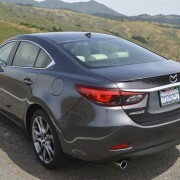 But if you opt for the $2,500 GT Premium Package (Code ZPP), you can move the 6 into the near luxury class as well. In particular, the Nappa leather-trimmed upholstery upgrade converts the seats from utilitarian to plush. Our Machine Grey Metallic 6 ($300 extra color) looked particularly handsome with its Premium Package “Parchment Nappa Leather” seats. Both front and rear get the full treatment, with perforated seating and back support surfaces, set off by prominent side bolsters seamed in a contrasting shade of putty. 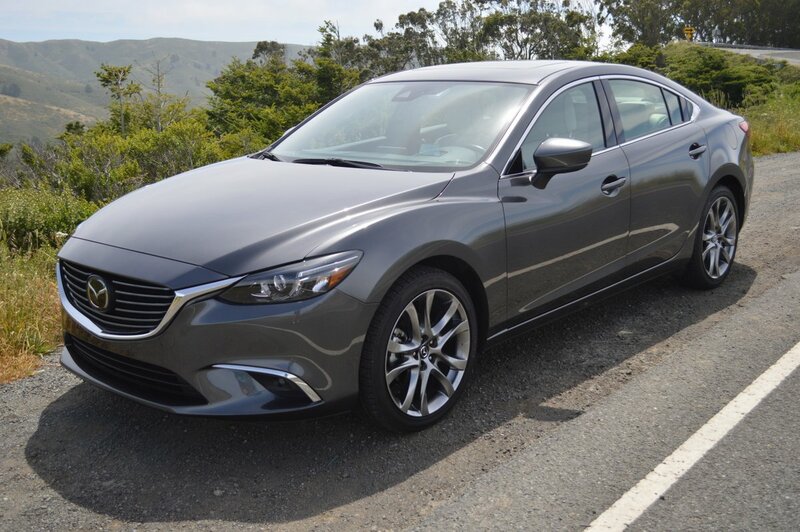 The Premium Package also includes “Bright Finish Interior Trim” which is tastefully done alloy sheathing on the steering wheel spokes, door pulls, window button bezels, air vent surrounds and instrument rims. 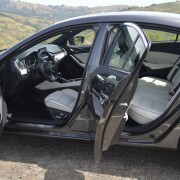 Also included in the optional package are a dark, soft texture headliner, plus a heater for the steering wheel and rear seats. Heated front seats are already standard. 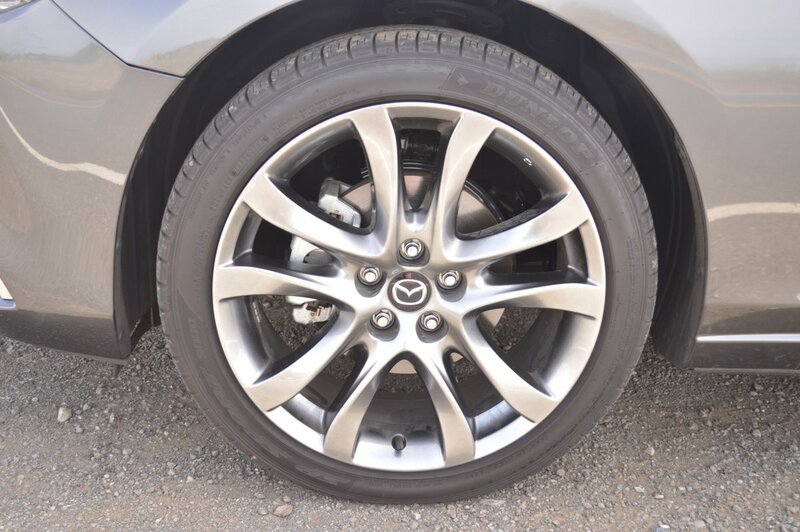 Mazda thoughtfully provides a 125/70/17 Kenda spare time inflated to 60psi along with the basic tools you’ll need to perform an emergency roadside flat tire change. The enormous rear trunk (15 cubic feet) is covered with a useful, optional $75 cargo mat that is ribbed for package retention and waterproof as well. In the trunk you will also discover a pair of pull releases that allow you to flatten the rear 40/60 split seats for an even larger storage platform. 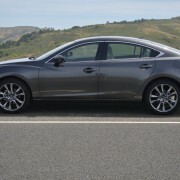 In sum, the latest Mazda6 is not only entertaining to drive, but eminently practical and economical at 30 MPG in overall use. 2010 Subaru Outback 2.5i Review – A safe car for the storm of the decade. 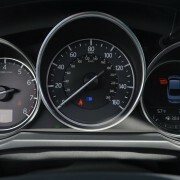 2008 Chevy Malibu LTZ Review - Could this be a turning point for GM?